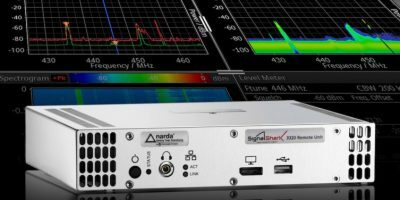 For radio-monitoring applications, Link Microtek offers the remote-controlled version of Narda Safety Test Solutions’ SignalShark real-time spectrum analyser. It monitors radios for organisations such as regulatory authorities, mobile phone network operators, police and security services, intelligence agencies and the armed forces. Covering the 8kHz to 8GHz frequency range, the SignalShark 3320 remote unit detects, analyses and classifies a range of signals. It also locates the source of transmissions using either automatic direction finding or time difference of arrival (TDOA) techniques. The instrument uses advanced FFT computations to achieve a 40MHz real-time instantaneous bandwidth with a 100 per cent probability of intercept (PoI) for signals longer than 3.125 micro seconds, which means that there are no gaps in the frequency span and every signal event can be detected reliably, even if it is extremely brief and transient, says Link Microtek. The unit is also able to capture the spectrum over the full frequency span in a single measurement at a fast scan rate of 50GHz/s. The 3320 has an integrated computer running Windows 10 and provides a flexible GUI with four task modes to support a variety of measurement applications, namely scan mode, real-time spectrum mode, auto DF mode and real-time streaming mode. Different views can be selected to visualise measurements. For example, the user can choose to display the frequency domain and channel level at the same time by selecting a spectrum view and a level meter view. The persistence view in real-time spectrum mode makes it very easy to spot interfering signals even if they are only transmitted sporadically, explains Link Microtek. The source of the interference can be tracked down using dedicated SignalShark direction finding antennae. The SignalShark 3320’s RF front-end provides four switchable RF inputs, which allow several different antennae – covering different frequency bands, for example – to be connected at the same time without the need for a complex switch that conventional single-input analysers require for this purpose. Available in either stand-alone or 19-inch rack-mount versions, the SignalShark 3320 is accessed with remote desktop software via a network and can also be operated locally by means of an external monitor, keyboard and mouse. Using the SCPI remote control protocol and VITA 49 compliant I/Q streaming, the unit will integrate easily into almost any software environment, reassures Link Microtek.